In times of crisis, when children are at their most vulnerable, Save the Children is there. We are always at the ready — and always among the first agencies that help during natural disasters. Delivering lifesaving emergency relief. And staying as long as it takes to ensure children and families can recover from the losses, restore their lives and build their resilience for years to come. Wherever and whenever children need us most, we are there. Yemen is a perfect storm of humanitarian, protection and economic crises, with each fueling the other. March 26 marks four years since the conflict in the country escalated. In that time, Yemeni families have witnessed the horror of more than 19,000 airstrikes and continuous ground fighting. Over the last year, 37 Yemeni children have been killed or injured by foreign bombs each month. Twenty four million people, including 12.3 million children, need humanitarian assistance – without this, their prospects of survival dwindle every day. On the four-year mark of the escalation of the conflict, here are four facts you need to know. 85,000 children under the age of five may have died from extreme hunger or disease since the war started in 2015. Children who die from Severe Acute Malnutrition suffer immensely as their vital organ functions slow down and eventually stop. Their immune systems are so weak they are more prone to infections with some too frail to even cry. 2 million children are currently missing out on an education, and 1,800 schools are unfit for use. Save the Children is working hard to keep children in school or giving them access to safe places to play and escape the trauma they are experiencing. An estimated 2 million children do not have access to clean water, sanitation and hygiene. In some parts of the country, the water supply is only turned on for an hour a day and 46% of the population lacks access to safe drinking water. 2 million children are without adequate access to healthcare. More than half of all health facilities have closed or are only partially functional. There are no doctors available in 18% t of the districts in Yemen. Save the Children calls on all parties to Yemen’s conflict to support the ongoing peace process, to take urgent steps to protect civilians, to work toward stabilizing the economy and to allow complete and unconditional access for humanitarian and commercial goods into Yemen. To learn more about Save the Children’s work in Yemen and how you can help, visit our website. YOUR SUPPORT CAN MAKE THE DIFFERENCE FOR CHILDREN AND FAMILIES IN NEED. MAKE A DONATION TODAY TO OUR YEMEN CHILDREN’S RELIEF FUND TODAY! This is the third of a three-part blog series written by a mother named Sukaina who is living and raising her young son in Yemen. Sukaina works for Save the Children in her home country, which has been at war since 2015. The war has changed everything for me, my family and families across Yemen. So many have left. My husband used to have a good job, but he lost it when the economy crashed. He has a degree. He speaks English well, but right now he goes out every day trying to find a job that pays. It has been more than two years since public servants, public school teachers and doctors have been paid. My brother is a dentist, but now he teaches Biology at a high school. We are just glad he found a job at a private school that gives salaries to teachers. My cousin used to have an excellent job as a Finance Officer. The company had to shut down when the war started. Now it has been four years and he is desperate to find any kind of job to look after his wife and two daughters. I worry about him – his face has gone pale and he is just exhausted, worrying every day about how to feed his girls. People like me, who are lucky enough to still have a job, support their whole extended family. I support my parents, my brother’s family, my grandmother, and my cousin’s family. Although the support I provide them is very basic and is barely enough, it is better than nothing. Everything in the shops is so expensive. I used to buy diapers without thinking about it. Not now. They are a luxury item. Many families use plastic bags or cloths in children’s underwear for their newborn babies, because they cannot afford the price of diapers. Transport, hospital, schools, nurseries – everything is breaking down. Over past six months, I’ve taken my son to seven different nurseries. Often, it is overcrowded. He comes home dirty, because there is only one carer for every 10 children. I’m looking for a new nursery, but I want it to be close to my work, because when the airstrikes start, I need to be able to run there to get him to a safe place. Everyone keeps abandoning Yemen. I can’t. I am the provider for my entire family. I can’t abandon them. I can’t abandon my country. I figured that it will be mentally exhausting for me and I will find no joy living elsewhere, knowing that my country and my family and friends are struggling to survive. That is why I am still here. What hurts the most is the feeling that we have been neglected by the outside world. I am grateful to Save the Children and their supporters for not forgetting us. Seeing the work we do in Yemen is a great relief for me. To learn more about the work Save the Children is doing in Yemen, visit our website. YOUR SUPPORT CAN MAKE THE DIFFERENCE FOR CHILDREN AND FAMILIES IN YEMEN. PLEASE DONATE TO THE YEMEN CHILD’S RELIEF FUND TODAY! This is the second of a three-part blog series written by a mother named Sukaina who is living and raising her young son in Yemen. Sukaina works for Save the Children in her home country, which has been at war since 2015. When I think about my son, I get tears in my eyes. He is three and all he has ever known is war. This is what happened the night he was born. It was midnight when my contractions started. We had to go to three different hospitals before we found one where they had electricity. There were airstrikes all around – it was so scary. In the end, I needed a C-section and I asked to have a general anesthetic because I didn’t want to hear the sound of bombs when my son was born. So war has been part of his life, right from the start. I feel like it has stolen his childhood away. He is three years old! He wants to go out and explore, but we have to keep him indoors where it is safer. He can’t play with water outdoors because he could get cholera. Or play football in the street because it is too dangerous. This isn’t what I want for him. Before the war, we used to have big family gatherings. I loved them. Everyone would eat together. The kids would play – it was such a happy time. Now, all we talk about is the war. We are exhausted. We are tired of crying. We are tired of war. All we want is to have a safe life where our children could live an ordinary life. This is the first of a three-part blog series written by a mother named Sukaina who is living and raising her young son in Yemen. Sukaina works for Save the Children in her home country, which has been at war since 2015. It is morning, but as I write this blog post, I am already thinking about what will happen tonight. Will there be airstrikes? It was quiet for the past couple of months, but lately airstrikes have resumed. I remember how excited we were when we moved into this apartment – me, my husband and my son. It’s on the ninth floor! Which means that we have to take the stairs every now and then because electricity is not always available. My apartment views over Sana’a (that’s the capital of Yemen) are amazing, but then the airstrikes started again on the night we moved in. There were four airstrikes that targeted the same neighborhood where my mom and my handicapped grandmother lived. I called my mom and I asked her to stay away from the windows and to be careful. I couldn’t sleep and I was worried about her, until she texted me three hours later saying everything was OK.
Now, whenever the airstrikes happen, I lie with my little boy – he is three years old – and his one-eyed cuddly sheep and we cuddle until it is over. We stay where we are because this building has no shelter. Even if we ran down the stairs – nine floors, remember – there would be nowhere to go. Sometimes, we put on headphones and play loud music to drown out the noise. At other times, we just listen to the sounds of the planes overhead. My little boy is so funny. He actually loves planes and carries a small orange airplane everywhere he goes. Every time an aircraft hover over, he gets all excited and jumps up and down. He says, “Whoah, let’s go see the airplane!” but I pull him away from the windows, because we don’t have any functioning airports here, so I know airplanes mean one thing: bombs. When I hear them approach, I think, “This might be the end”. So be happy is what I try to do. Even though my country is at war, bombs are falling, and people are going hungry, I try to smile and be happy for my son. Think of us tonight when you go to sleep – without the sound of airstrikes or the fear a bomb will wipe you out. Civilians fleeing violence face life-threatening risks the moment they embark on their journeys. The most immediate dangers are death or injury due to explosive weapons, which have been used indiscriminately by all parties to the conflict with little regard for their legal obligation to protect civilians in conflict. If displaced families manage to survive their dangerous journeys and avoid airstrikes and shelling to reach relative safety, they face further difficulties in strained host communities or in camps lacking in adequate food supplies and basic sanitation and hygiene. This puts young children at risk of malnutrition and disease in a country where the health system has all but collapsed and some 14 million people are on the brink of starvation. Save the Children estimates 85,000 children have already died from extreme hunger and disease since 2015. YOUR SUPPORT CAN MAKE THE DIFFERENCE FOR CHILDREN AND FAMILIES IN NEED. PLEASE DONATE TO THE YEMEN CHILD’S RELIEF FUND TODAY! It was 13 years ago, in August 2005, when Hurricane Katrina wreaked havoc along the U.S. Gulf Coast, leaving 1,833 people dead. Thankfully, few children died as a result of Hurricane Katrina. But the storm has had a lasting, negative impact on tens of thousands of children who survived, only to suffer serious emotional and developmental consequences for years afterward. In the days and months following Hurricane Katrina, Save the Children worked tirelessly to protect children from harm. We developed Journey of Hope, a program that helps children and the adults who care for them cope with loss, fear and stress. The evidence-based program also aims to help children become more resilient in the aftermath of a hurricane. Until recently, Hurricane Katrina was recognized as the most destructive storm in U.S. history. However, with reports out of Florida describing the area as a “war zone,[i]” experts are concerned that Hurricane Michael, just 2 mph short of being classified as a Cat. 5 hurricane when it ripped into the panhandle[ii], will be even more devastating to some coastal communities. Here’s why: Hurricane Michael’s path impacted some of Florida’s and Georgia’s poorest counties. Poorer families are often hurt hardest by storm’s fury and have more difficulty recovering. What’s more, these inland communities of Florida are less accustomed to dealing with powerful hurricanes. We already know that 20 of 38 schools in Bay County, Florida have been damaged. “We’ve seen schools that are completely destroyed. Children will be out of school indefinitely,” said, Sarah Thompson, team leader on the ground. The potential for Hurricane Michael to have a widespread, deep and enduring impact on children’s mental health is great. When forced to evacuate from their homes, many people – particularly the poor – have no choice but to turn to emergency shelters. Unfortunately, our national sheltering system doesn’t adequately account for the unique needs of children, making them vulnerable to injury and abuse. Early reports are that conditions in shelters in and around Panama City are extremely poor. There is limited electricity and no running water, which means displaced children and families are unable to bathe, making an uncomfortable situation unsafe and more likely to spread illness. “These shelters are meant to be temporary, but families we met may be here for a very long time. We have to help make them better,” said Sarah Thompson. Thanks to the generous support of our donors, Save the Children’s emergency response team is preparing to set up safe play spaces in shelters in the Panhandle’s hardest-hit areas – where children can play, learn and cope – and working to ensure shelter conditions are made safe and accommodating for families. To learn more about Save the Children’s work to help Hurricane Michael survivors, please visit: savethechildren.org/hurricane-michael. YOUR SUPPORT CAN MAKE THE DIFFERENCE FOR CHILDREN AND FAMILIES IN NEED. MAKE A DONATION TODAY! The mental health needs of children following an emergency are immense. Stress caused as a result of lost homes and lost communities can have a widespread, deep and enduring impact on children’s mental well being. As reports surface on the damage caused by Hurricane Michael, a Category 4 hurricane at the time it made landfall in Florida, Save the Children is actively working to protect vulnerable children and provide immediate support for families affected by the storm by distributing critical supplies. Our long-term response efforts will focus on providing much-needed emotional support to children as well. Save the Children knows this is unacceptable. Through the generous support of our donors, we are working to provide schools and communities with structured programs designed to support the emotional development of children following an emergency. Children have unique needs that make them the most vulnerable in a disaster. From their small bodies being at greater risk of illness or harm during an emergency to their dependency on routine to help them make sense of their surroundings and feel comforted, children have the potential to suffer the most following an emergency. The long-term negative impact of a disaster can be mitigated. With some basic training, parents, teachers and caregivers can help protect children from further harm following an emergency. Providing reassurance and validation of emotions while working to normalize routines and returning to learning can all work to reduce the mental harm caused to children. Children’s well-being depends, in large part, on the stability and well-being of their parents and caregivers. Children understand and process events based on messages they receive from those responsible for them. Helping parents and caregivers to process their experiences and develop resources for coping is the first step in increasing their ability to support children. By attending first to their own emotional needs, parents and caregivers can be more fully present and attentive to the needs of children. Children communicate stress differently. There is no one way in which children express worries and fears. Each one may communicate upset feelings in different ways. It’s important to recognize both the physical symptoms and behavioral changes that can mask trauma. Sleep disorders, irritability and acting out area also ways in which children may communicate stress. A donation to Save the Children’s Hurricane Michael Children’s Relief Fund will help support the urgent needs of children and families. Please donate now. To learn more about Save the Children’s work in Florida and across the United States, please visit: savethechildren.org/USA. [ii] Abramson, D., Park, YS., Stehling-Ariza, T., and Redlener, I. “Children as Bellwethers of Recovery: Dysfunctional Systems and the Effects of Parents, Households, and Neighborhoods on Serious Emotional Disturbance in Children After Hurricane Katrina.” Disaster Medicine and Public Health Preparedness. 4. (2010). pp. S17-S27. At least 600,000 children have been affected after a catastrophic 7.5 magnitude earthquake and 20-foot-high tsunami struck Indonesia on September 28. Nine-year-old Puri* is one such child. Trapped under rubble for five hours, Puri was found and rescued by her brother and a group of other but suffered a serious head injury. Here is her story. Puri*, 9, with her brother, Dimas*, 33, await an emergency plane in Palu, Indonesia to take them to Makassar for treatment. Photo Credit: Junaedi Uko / Save the Children. The ground beneath Puri’s house began to shake just as she was preparing her evening prayer. The pillars of the house fell on her head before Puri had a chance to realize what was happening around her. She cannot remember anything after that. When Dimas found Puri she was almost unconscious, buried face downwards in the rubble. She had been using her one free hand to make noise and attract attention. “Some people who were also looking for their families heard her cries,” said Dimas. Miraculously, Puri’s cries for help were heard. She was found alive but was badly hurt and suffering from a serious head injury. 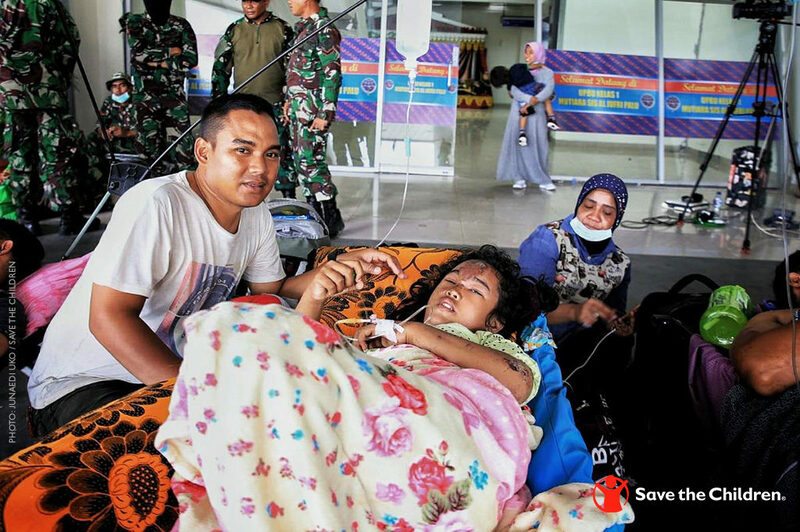 When Save the Children spoke to Puri and her brother, the siblings were at Mutiara Airport in Palu, awaiting an emergency plane to take them to Makassar for treatment. Save the Children, working through its partner Yayasan Sayangi Tunas Cilik (YSTC), has delivered vital aid on a military plane to Palu. “I can’t overstate how much this aid is needed by children and families impacted by the disaster,” Zubedy Koteng, Child Protection Specialist with Save the Children’s national entity in Indonesia, said. “The earthquake and tsunami cut off many transport routes in this remote area. We sent out three teams, on different routes, with as many supplies as they could carry to ensure we could reach people as fast as we could but the journey has taken days. We are relieved that these much-needed supplies have arrived by plane and are starting to get through. Save the Children has been working in Indonesia since 1976, and has a long history responding to humanitarian disasters in the country, including the recent earthquakes in Lombok and the 2004 Boxing Day tsunami. To learn more about Save the Children’s work in Indonesia and how to help, please visit: savethechildren.org/Indonesia. Save the Children knows from years of experience that children are often the most vulnerable when disasters like earthquakes and tsunamis hit. In 2004, we mounted one of the largest humanitarian recovery efforts in Aceh following the Boxing Day Tsunami. We have spent the two decades since investing in the region to better prepare the children of Indonesia and their families for natural disasters. 1. Indonesia is the world’s largest country comprised solely of islands, a fact that puts the delicate islands constantly at risk of earthquakes, volcanic eruptions, floods and tsunamis. 2. Widespread poverty, political instability and poor resource distribution contribute to the region’s fragile infrastructure, which is why Save the Children has been working in Indonesia for more than three decades. 3. On December 26, 2004, an underwater earthquake off the coast of Indonesia triggered a tsunami that killed more than 200,000 people. The 100-foot-tall wall of water devastated the coastline of nine countries on the Indian Ocean and thousands of communities were left in ruins. Save the Children’s dedicated emergency responders were there, helping 276,000 survivors recover. 4. On December 7, 2014, a deadly 6.4 magnitude earthquake struck the Indonesian island of Sumatra. In Pidie Jaya district, one of the two worst affected, an estimated 25% to 30% of schools sustained damage, with at least seven schools totally destroyed. Save the Children responded, setting up temporary classrooms and establishing child friendly spaces so that so children could have a place to be safe and engage in educational play while their parents began the recovery process. 5. Today, Save the Children’s teams are working around the clock to help protect vulnerable children and provide desperately needed relief to families in the wake of a 7.5 earthquake and tsunami that hit Indonesia’s Sulawesi on September 28. The magnitude quake triggered a tsunami with waves reportedly up to three meters high near the island’s capital Palu. Thousands are feared dead, with a confirmed death toll at 1,400 and rising. 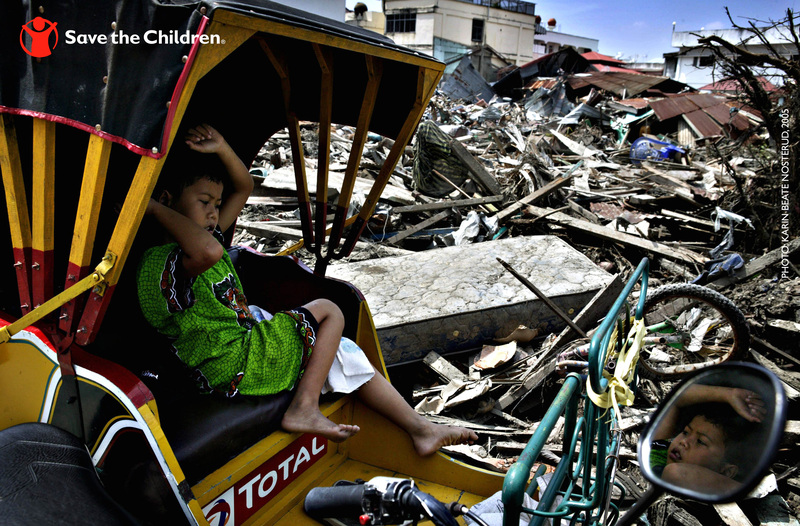 Widespread destruction is evident and hundreds of thousands of children remain at grave risk. Save the Children is providing emergency supplies and hygiene kits to families affected by the quake and are planning to set up Child Friendly Spaces in shelters for those who have lost their homes, to ensure families and children are safe and have the supplies they need, like diapers and cribs. While we still don’t know the full scale of the crisis yet, we do know it is immense and have grave fears for the families in this area. 6. 2004, 2016 and now 2018 all mark historic dates around devastating tsunamis and earthquakes in Indonesia. Many thousands of children lost their lives and many surviving children lost one or both parents. Children – especially those living in poverty – are the most vulnerable victims of a disaster and its aftermath. Their families are uprooted and their normal routines are often destroyed. 7. As Save the Children continues to respond with emergency assistance, we need your help now more than ever. Your generous gift can help protect vulnerable children and provide desperately needed relief to families. To learn more about Save the Children’s response and how you can help, please visit our website. On December 26, 2004, an underwater earthquake off the coast of Indonesia triggered a tsunami that killed more than 200,000 people. The 100-foot-tall wall of water devastated the coastline of nine countries on the Indian Ocean and thousands of communities were left in ruins. “What could have been a follow-up catastrophe to the tsunami in terms of malaria, typhoid, cholera or pneumonia, never happened because people gave generously for medical supplies, shelters and care for children and that made all the difference. Did it really save those children? The answer is yes,” said Charles MacCormack, president and CEO of Save the Children at the time. 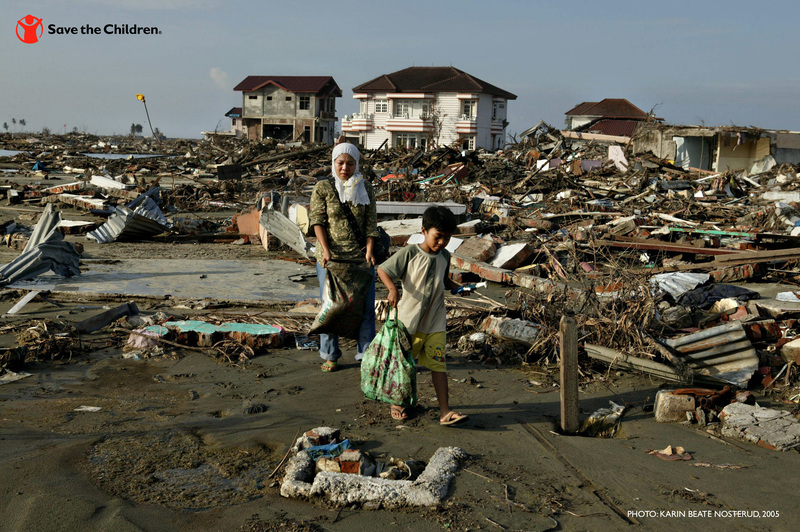 An 8-year-old boy is surrounded by debris and destruction following the 2004 tsunami that struck Indonesia on December 26. Today, our commitment to the children of Indonesia remains as strong as ever, as we urgently work to help protect vulnerable children and provide desperately needed relief to families in the wake of a 7.5 earthquake and tsunami that hit Indonesia’s Sulawesi on September 28. Power outages and landslides have blocked key roads and rendered the most impacted areas, including Dongala, out of reach for now. Other vital infrastructure including the airport in Palu have been badly damaged. Many children and families are sleeping outside because their homes were damaged and aftershocks continue. As Save the Children continues to respond with emergency assistance, we need your help now more than ever. Your generous gift can help protect vulnerable children and provide desperately needed relief to families. The situation for Yemen’s children is nothing short of dire. Some 11.3 million children in Yemen are facing a triple threat of bombs, hunger and disease. The journey for those trying to flee, however, is often no safer: families have to brave minefields and airstrikes and are forced to cross areas of active fighting, all in a bid to escape the embattled governorate. There have been 18,000 airstrikes since March 2018, killing 2,398 children and injuring countless more.1 Civilian casualties in the most impacted districts more than doubled in the start of July as the fighting moved to more populated areas, according to the UN’s Refugee Agency. Children’s injuries incurred as a result of airstrikes are often complex and require a specialist treatment. Families on the run need to sometimes make the impossible decision of whether to continue to flee towards safety or stop and seek out medical care, if they can afford it. Eight-year-old Razan* was severely wounded in one eye after a bomb exploded nearby as she and her father tried to leave. She was in agony for days and her family feared she was permanently blinded. “When Razan was injured, the airstrike was just yards away from us. The airstrike hit an armored vehicle nearby and flying shrapnel hit Razan in the eye. I tried to get us to a safe place to have a look at her eye, and then I bandaged her up with my shawl. Then we had to carry on moving,” said Samir,* Razan’s father. Razan eventually reached a specialist hospital, where Save the Children referred her for emergency surgery that should restore her eyesight. Thanks to support from Save the Children’s donors, Razan received the special medical care she needed. But there are many more children like her who are not getting the care they need. To learn more about the work Save the Children has done to help children in Yemen, visit our website. YOUR SUPPORT CAN MAKE THE DIFFERENCE FOR CHILDREN IN NEED. MAKE A DONATION TODAY!